I used to think I knew how to eat healthy until I realized that just because a keto diet or low carb diet made me lose a ton of weight did NOT mean that I knew how to nourish myself. The outside does not always tell the truth. 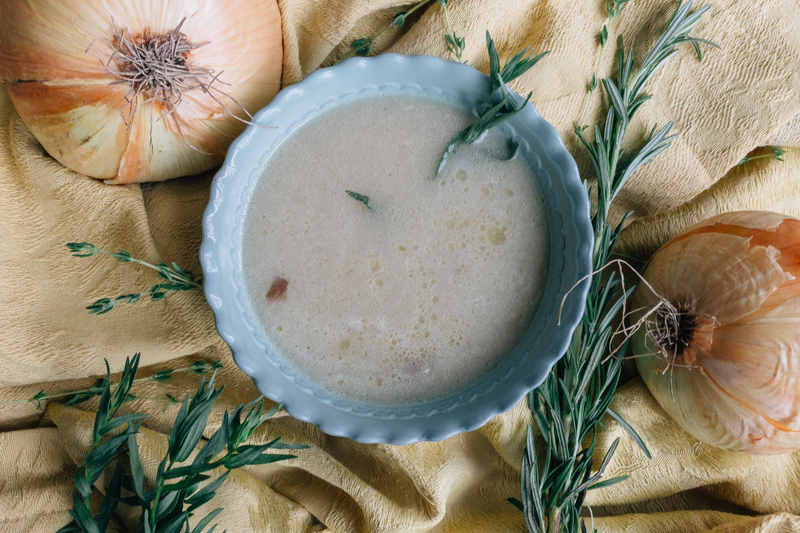 But ever since I learned how to make broth and then soup from that broth I have become the biggest soup fan of all time and this is in my top 3 favorite soups of all time: Onion soup. Garlic & Onions: They can be your friend or foe, but hopefully your friend. Researchers have found correlations between high garlic and onion intake and lower incidence of cancer and heart disease, believed to be connected to the allyl sulfides and bioflavonoids in these two plants. 1. Bring stock and oil to a boil. 2. Add veggies and turn the heat down to a simmer. 3. Add bouquet garni, cover, and then cook for thirty minutes. 4. Remove the bouquet garni and puree the soup with immersion blender. 5. Season with sea salt to taste. Add cultured cream to top. Every 2 weeks I send: A recipe, A study, A practice, & A tool to help you improve your gut, your brain, & your life!